Compensation for Pain and Suffering After WI Dog Bite | Hupy and Abraham, S.C.
Can a Wisconsin dog bite victim recover damages for pain and suffering? Most Wisconsin dog bite victims suffer more than physical injuries from a dog attack, and Wisconsin law allows those who experience pain and suffering to recover compensation for these injuries. Withdrawal from loved ones and favorite activities. Feelings of intense anger or rage. Regression to out-grown behaviors, including bedwetting or thumb-sucking. 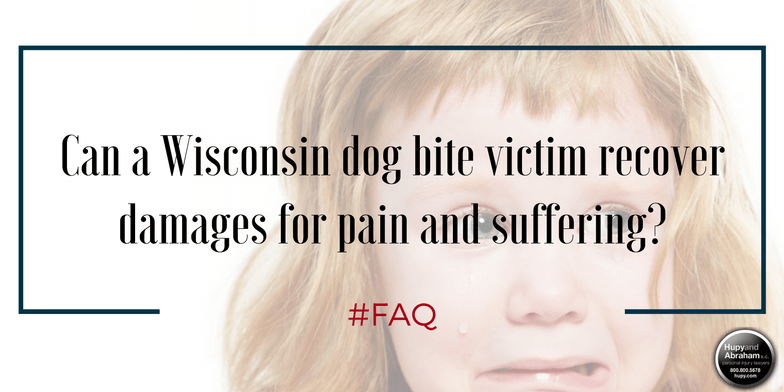 If you or your child experiences any symptoms of psychological or emotional injury after a Wisconsin dog bite, then it is important to talk to a doctor. A dog bite is an extremely traumatic event, and your symptoms are the natural response as your brain tries to deal with the horror you experienced. You can get help. Asking for help does not make you weak. Your lawyer can help you gather the necessary evidence and make convincing arguments for your full recovery of damages for your non-economic injuries such as physical pain and emotional suffering. The money that you recover for these injuries can help you afford the care and accommodations that you need to heal and recover as fully as possible. If you were injured in a Wisconsin dog bite attack, our experienced dog bite lawyers can help you hold the dog owner liable for all your injuries. However, your time to take action is limited so it is important that you learn about your rights and take the necessary steps to protect your dog bite recovery now. To learn more, contact Hupy & Abraham at 1-800-800-5678. The initial consultation is always free.